If you neglect your lawn for even a few weekends in the spring, you might be amazed by how quickly it can get out of control. Crabgrass, dandelions, and overgrown grass are some of the common symptoms of lawn chaos. Don't worry, though! 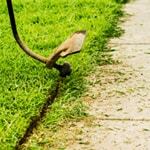 With just a little bit of regular upkeep and the help of a few garden tools, such as a trusty string trimmer, you can restore order to your yard and make your lawn look better than ever. Just follow these simple steps and you'll have a lush, green yard in no time. It sounds like a basic idea: "Control your weeds by removing your weeds!" But there's more to effectively weeding your lawn than simply mowing it. In fact, cutting down weeds with a string trimmer or mower might make your weed problem worse. Instead of getting rid of your weeds, mowing often spreads their seeds. One dandelion can produce 15,000 seeds. Imagine if all those seeds took root on your front lawn! Mowing also fails to remove the roots of the weeds, which means that they still might grow back. The best solution is to remove the weeds by hand, roots and all. Tools such as a garden spade can make digging easier. Applying an herbicide or an herbicide alternative is also an effective form of weed control. Although you should pluck those weeds whenever you find them, actively weeding your lawn or applying your herbicide in the fall will prevent new weeds from taking root the following spring. Of course a well-manicured lawn looks great, but did you know that mowing and trimming your lawn are also the most effective ways to keep weeds in check? It's not about cutting down your weeds, either. By keeping your grass at a proper height, you help it stay healthy enough to make use of all the sunlight and nutrients that weeds also want to absorb. Don't cut your grass too short, though. Long, healthy blades of grass produce long, healthy roots that are more efficient at absorbing water and nutrients. The rule that many lawn care enthusiasts follow is to never trim more than a third of the grass's height at one time. For most grasses, a mowing height of two to three inches during the growing season is ideal. Also, whether you're cutting your entire lawn with a mower or trimming a small patch with a string trimmer or even garden shears, be sure your blades are sharp (or your string trimmer's line isn't brittle). A sharp tool will leave a clean cut, which puts less stress on your grass. Regularly cutting your lawn is an excellent way to keep it healthy. 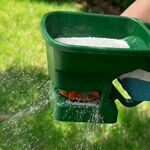 Another way is to make sure your grass get the nutrients it needs to outgrow any weeds by properly applying fertilizer. The number of times you fertilize your grass each year depends not only on weather conditions but also on the type of grass you grow. Some grasses such as fescue, for example, generally need less water and fewer nutrients than other types. You might fertilize your grass between one and four times each year. If you're only applying fertilizer once, the best time to do it is generally in the late summer or early fall. When shopping for fertilizer, you'll find "weed and feed" products available. These products combine fertilizer with weed-killing herbicides for convenience. However, they might not be the most effective way to kill your weeds, since you might not need to apply herbicide at the same time you fertilize. Spot treatments with separate herbicides are recommended instead. Watering your grass is another way to keep it green and dense so that it crowds out any sprouting weeds. However, a common mistake with watering is doing it too frequently. As a general rule of thumb, grass needs about an inch of water per week during the growing season. If it's extremely hot or your area is experiencing a drought, your cool-season grasses will need between a quarter-inch and a half-inch of water every two to four weeks to survive. The best time to water your lawn is the early part of the day. 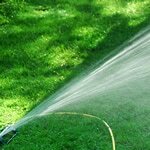 If you water during the middle of the day, when the weather is warmest, too much of your water might evaporate before your grass can use it. Watering in the evening is acceptable, but you risk leaving moisture that can encourage fungus and lawn diseases to flourish. Lawn Weed Control - Find out How To Get Rid of Pesky Weeds. Our string trimmer how-to library can help you pick the perfect electric string trimmer, gas string trimmer, walk behind string trimmer or brush cutter.